Dwyane Wade averaged 1.67 blocks per 48 minutes this season – far and away the highest rate of any guard in the league. To put that number into perspective, there's a greater gap between #1 Wade and his closest competition, Rasual Butler, than between Butler and the 11th ranked guard, Kobe Bryant. Stats like this -- along with his high steals totals -- have fueled the popular perception that Wade is one of the league's premier defenders, and are probably why he finished third in the Defensive Player of the Year voting, behind only Dwight Howard and LeBron James. Wade seems like a fairly capable defender who takes a lot of gambles -- sometimes to good effect (the high blocks and steals numbers), and sometimes to his team's detriment. With this in mind, I sat down Sunday night to watch the Heat's playoff opener with the intention of breaking down Wade's defensive performance against Atlanta's best player and Wade's counterpart at shooting guard, Joe Johnson. What better defensive assignment to get an honest read of Wade's talents? Johnson is a big 2 guard who can score in every way imaginable -- shooting from long range off the dribble, posting up smaller guards, driving to the cup, spotting up, etc. He's a handful, and a definitive test for any top defender. Only ... Dwyane Wade wasn't guarding him. That responsibility was left to James Jones. Wade loves to rove the passing lanes -- it's the defining feature of his defensive game. No matter where he is on the court, Wade is almost always playing the ball. Sometimes this strategy produces a steal, but sometimes the ball works its way to Wade's man for an open perimeter jumper, because Wade is busy anticipating an entry pass and is too far away to close on the shot. Wade's likelihood to rove is inversely proportional to how deadly the shooter he's guarding. In a couple of games against the Lakers this season, Wade didn't concern himself with the passing lane while covering Kobe Bryant, but left Trevor Ariza all alone on a couple of occasions trying to anticipate Laker passes from the pinch post. A fair number of Wade's blocks come on "horror flick" plays: Wade will get caught on a pick or a rub. Just when you think Wade is out of the play, he'll recover, then swoop in for the kill as the shot goes up. Remember that crazy game against Chicago back in March when Wade hit the running three-pointer at the horn in double overtime? Wade blocked a Ben Gordon jumper at a crucial juncture in the final minute of the first OT after catching up to him off a Brad Miller screen. Because Wade plays so far off his man, he's vulnerable off the dribble, even against guys you wouldn't characterize as slashers like, say, Delonte West. The sequence usually occurs something like this: Wade, on the weak side, is cheating toward the help line. A skip pass to his man leaves Wade in no-man's land, scrambling to close. Wade is lightning quick, so he's actually able to recover and contest the shot -- except that the shooter uses Wade's agility and momentum by driving past him toward the hole. Cheating doesn't come without risk -- but there's also a great deal of reward. For every instance like the one above when a slower offensive player exploits Wade's willingness to cheat, there's another clip in the archives where a seemingly wide open corner jumper is blocked by Wade as he leaps toward the shooter. Nobody in the game closes daylight quite like D-Wade, and the number of times it happens is astounding. As a straight-up on-ball defender, Wade likes to go for the strip, and will often pay the price. 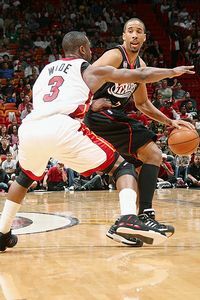 Bigger guards, like Jason Richardson, will power by him when he reaches, while heady but less athletic players, like Ray Allen and Marquis Daniels, will anticipate Wade's swipe and burst ahead the moment Wade tries to strike. This leaves Miami's back line with a lot to clean up. It's a little confounding because Wade seems well-equipped to guard a player like Daniels without having to gamble. When Wade foregoes a steal attempt and plays straight-up perimeter defense, he appears to be an above-average defender. He's not the lockdown sort (slow, crafty guards like Andre Miller and Raja Bell are seen taking him off the dribble), but Wade generally does a very nice job of leveling off his man and funneling penetrators to Miami's help defenders. In the post, whether against Joe Johnson or Paul Pierce, Wade will almost always try to compensate for his lack of size with his leaping ability. He'll play his man very close as he's backed in, anticipate the spin, then time for the block. This produces mixed results, though it's hard to imagine many 6-4 guards who can give up that kind of size, and still challenge a shot on the block. Can you think of a single one? How does Wade fight through screens when matched up against shooters like Ray Allen? The Boston video shows that he's neither ferocious nor frail -- though this might be more of a reflection of Miami's defensive philosophy than any failure of Wade's part. Measuring individual defense continues to be one of the basketball world's most difficult tasks. Will we ever be able to determine how much better or worse a defender Dwyane Wade would be if he stopped trying to pick Marquis Daniels' pocket? If Wade concerned himself a little less with the passing lanes and stayed closer to home? Do the volume of steals Wade racks up compensate for the easy baskets generated by his opponents when he gambled and lost? Advanced stats for defense are very much a work in progress, but those that are available demonstrate Wade to be a solid defender. His defensive rating of 103.7 at Basketball Prospectus. The only wing player with a better defensive rating? James, LeBron. Both 82games.com and Basketball Value show Miami's on court/off court defense to be about 2 3/4 points better per 100 possessions with Wade on the court, also quite good. The eye test seems to support this. Dwyane Wade might be an unabashed gambler, but over time he's beating the house. It's difficult to watch a series of ten clips of Wade on defense without seeing at least one easy breakaway bucket off a Wade-generated turnover. Whether that makes him the third-best defender in the league is an entirely different conversation, but as guards go, Wade is a defensive asset, one whose presence disrupts offenses, even from the weak side of the floor.